Product #3020 | SKU SASRK12 | 0.0 (no ratings yet) Thanks for your rating! The Samson Universal Rack Stand SRK12 is a rugged, steel universal rack stand featuring fully enclosed side panels. It stands on (4) heavy-duty, 3" casters with locking fronts, making movement of the cabinet a breeze. It was designed for 19" equipment and offers 12U of space. Included with the rack is a single-space, flanged blank panel. Its unique steel support-bar construction also allows this rack to be used with either European or U.S. thread sizes. 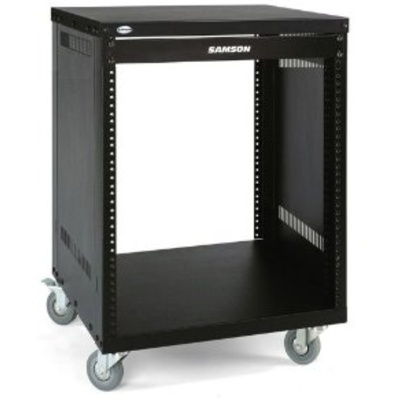 (4) Heavy-duty, 3" casters with locking fronts make movement of this rack a breeze. This product is guaranteed to be free from defects in materials and construction under normal use for a period of three (3) years from the date of purchase.